Peter Bosz will take his Bayer Leverkusen team to Dortmund on Sunday. If Bayern Munich wins on Saturday and Dortmund loses the next day, the two teams will be tied at the top of the standings. Six-time defending champion Bayern, which trailed by nine points a few weeks ago, has won three straight and hosts Hertha Berlin. Despite his dismissal in December 2017, Bosz is fondly remembered in Dortmund, where he can be sure of a warm welcome on his return. "Peter is a very fine guy, and an outstanding coach," said Dortmund chief executive Hans-Joachim Watzke, who regretted having to let the Dutch coach go after eight competitive games without a win. "You have such situations. But that has nothing to do with the regard we have for each other, rather that our team wasn't optimal for him and his philosophy." Leverkusen started with a loss in Bosz's first game in charge but has been the best team in the Bundesliga since the winter break, racking up wins over Wolfsburg (3-0), Bayern (3-1), Mainz (5-1) and Fortuna Duesseldorf (2-0). Bosz took over at Leverkusen from Heiko Herrlich in time for the second half of the season. Under him, Leverkusen produced 1,053 passes in the win over Duesseldorf on Sunday, a number not seen since Pep Guardiola coached Bayern against Hertha in March 2014 and produced 1,078 passes. The outstanding Kai Havertz has been one of those to benefit. "Of course its more fun to have possession than to run around after the ball. There are many things that are different, many positive changes. You can see that from game to game," the 19-year-old midfielder said. "We're aware that we're not perfect yet. We've only been together two months. But we're getting better from game to game and that's showing in the results, too." 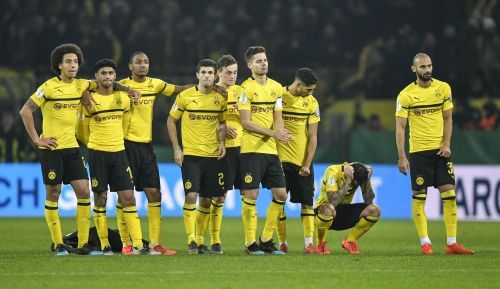 Dortmund has been held to draws by Eintracht Frankfurt, Hoffenheim (conceding three late goals after leading 3-0) and most recently last-place Nuremberg, a team they had beaten 7-0 earlier in the season. Watzke maintains he isn't worried by the lack of form. "Since summer and the rebuilding we've been repeating ad nauseam that this young team would suffer setbacks. It's totally normal," Watzke told the Bild tabloid on Wednesday. "Just the drop-off is big because of the strong performances in the first half of the season - we're aware of that." Dortmund hasn't been helped by Marco Reus' absence. The team captain injured his thigh in the German Cup loss to Werder Bremen on Feb. 5. However, Manuel Akanji is on the verge of making his comeback. The Swiss central defender hasn't played since Dec. 18. Watzke pointed out that Dortmund has lost only once in 22 league games, and said he was unconcerned about Bayern's resurgence. "They weren't our issue, they are not our issue and they will not be our issue," Watzke said. "We're quietly concentrating on ourselves, to cut out mistakes and to quickly get back on track with this young team." This story has been corrected to show that Bosz was Dortmund coach in 2017, not 2013.